Training, Racing and Winning in the Heat: Not Born Hot! Welcome, this is a very short ebook I have been writing on Training, Racing and Winning in the Heat. Each chapter will begin with an Aid Station or key point for the chapter. Please enjoy and feel free to email me questions for future chapters at sue@fewoman.com. Aid Station: Be careful what you hate, you just might be good at it! This is a picture of me from 1994: Note the bag of Cheetos in the bottom right corner! The best part of the picture is my newborn daughter. My size is unrelated to pregnancy (I adopted). Pathetic, huh? I am not even going to comment on my fashion choices back then. Paisley was cool. I swear. A few short years later I took up running. I finished my first marathon in 4:39:31. I was slow but getting fitter and I really enjoyed the training. In 2006, at the suggestion of a training partner, I signed up for my first triathlon. Somehow I had decided the Ironman race wisdom to slow down in transition applied to a sprint triathlon. My transition from swimming to biking took four minutes and fifty seconds. What was I thinking??? My friends continue to tease me that I made a cappuccino in the transition area (and given my love of espresso, it is quite possible). I loved the race experience despite being overweight and finishing towards the back of the pack. After the sprint triathlon, I decided to sign up and complete the Muncie Endurathon in Muncie, Indiana. It was one of the oldest 70.3 races in the country. And one of the hottest. I finished the race in 6:40 (384th out of 482) and swore I would never do a hot race ever again. Hell would freeze over first. Just one of many lies I have told myself through the years. Including my best lie of all; telling myself that the next bike purchase will be my last. My Ironman dream began in high school while watching Julie Moss crawl across the finish line at the Ironman World Championships in Kona (courtesy of ABC’s great show the Wide World of Sports). Amazing to think that I was inspired by watching a woman lose all bodily functions and crawl across a finish line. And that was just the beginning of the rest of my life. At age 40, I fulfilled an unlikely life time dream and completed my first Ironman (with no loss of bodily functions). I finished Ironman Wisconsin in 14:27 and despite the comfortable temps swore I was a one and done. How hot? The EMT’s were giving IV’s to runners on the race route! Notice the kid in the bathing suit retrieving used sponges for the athletes on the run! There is nothing worse than the joy you can feel from an ice cold sponge even if it has been grossly recycled from another athlete. If you have completed a long course triathlon, you understand how your hygiene standards become almost non-existent while racing. Gross but necessary. 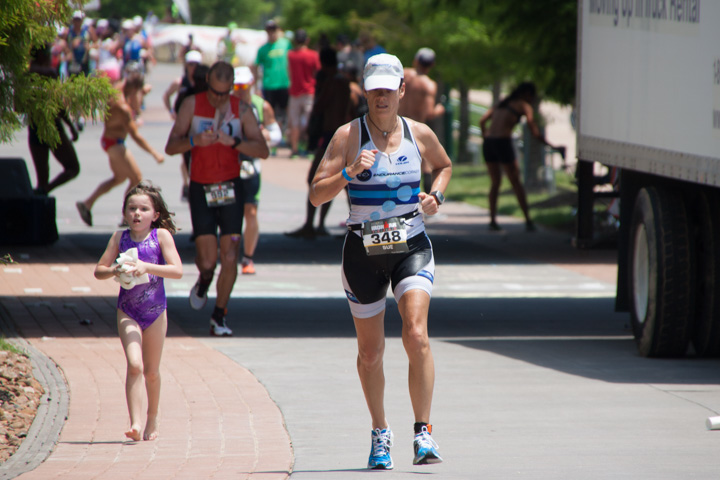 I am most proud of my two age group Ironman Champion wins at the two hottest races on the circuit; Ironman Louisville (15+ minute win) and Ironman Texas (AG Course Record of 10:35:23). In 2013 I finished as the Overall Champion for Ironman All World Athletes in my age group (women 45-49). I have achieved all this by embracing the thing I hate; racing hot. The following chapters will detail the secrets of my success through through the years to excel when I am literally in hell. If you don’t want to miss the future chapters, please sign up to subscribe for email notification of new posts in the upper right corner of my blog. Thanks for reading! No Replies to "Training, Racing and Winning in the Heat: Not Born Hot! "